Noonan Sensei (Sensei being an honorific term used in Martial Arts literally meaning ‘before person’ but used generally after a person’s name indicating a teacher). NOONAN SENSEI HAS SPENT HIS LIFE STUDYING MARTIAL ARTS AND IN PARTICULAR TRADITIONAL KARATE, THE ANCIENT OKINAWAN FORM OF TOUDI, WHICH WAS CODIFIED IN THE POST WAR ERA AND IS KNOWN TODAY AS THE STYLE OF CHITO-RYU KARATE-DO. In 1985, after 5 years of training in Australia, young Mike headed to Japan in search of deeper knowledge. His teacher William (Bill) Ker Sensei had introduced him to Soke Sensei, the Supreme Chito Ryu Instructor and the two formed a deep teacher-student relationship that has lasted until today. Every year since that first visit Noonan Sensei has returned to Japan for intense training, to further his education, to teach and to grade. As a result of this relationship Soke Sensei visits The Australian Institute of Karate for a week on a yearly basis. Noonan Sensei’s pedigree comes straight out of the annals of Martial Arts history. His teacher is the current Head of Style, Soke Chitose, who received the tradition from his father, renowned Okinawan ‘Kake-Dameshi’ (Challenge Match) fighter, Dr Tsuyoshi Chitose (Snr), who became the Sixth Master of Tode, in a successive lineage that began with; the First Generation Beechin Chinen, who along with the Second Generation Beechin Matsumura, was a member of King Shokei’s Royal Guard, the Third Generation Uekata Awane was a member of King Shoiku’s Royal Guard, Fourth Generation was Beechin Hokama, and the Fifth Generation was Chitose’s teacher Sesho Aragaki. He was also under the tutelage of such luminaries as; Chotoku Kyan, and Kanryo Higaona. Noonan Sensei’s technique comes from this unbroken lineage directly to his students. 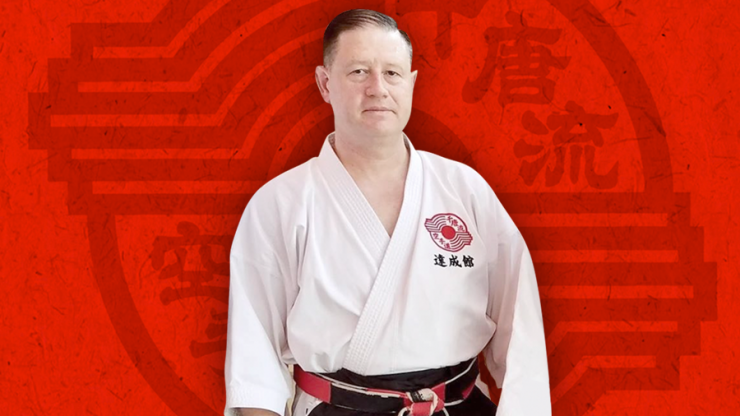 “Recently, Noonan Sensei visited our dojo, Sunshine Coast Karate, as a guest instructor and it was one of the most incredible training experiences I have ever experienced. His attention to detail and skill is in a world of its own. Noonan Sensei’s technique has been refined to unimaginable levels for most to comprehend and it’s devastating. Not only is Noonan Sensei’s understanding of Chito-Ryu Karate-Do of a superior level, you must also acknowledge the effect of 37 years of dedication and how this strengthens an individual from the inside out. Studying with Noonan Sensei, you will be expanded out of your comfort zone and you will become best friends with ‘commitment’, ‘self-discipline’, ‘patience’, ‘focus’ and so much more. You will learn, you will work hard and you will grow. Observing Noonan Sensei teaching various age groups and levels whilst on the Sunshine Coast, I can attest to his ability to engage and connect with students in a deep and meaningful way. Noonan Sensei’s way of teaching is loaded with great information and presented with passion, patience and a touch of humour. All of which help to cultivate a warm, friendly and positive learning environment. Noonan Sensei also has remarkable insight when it comes to training your body in order to enjoy optimal health benefits for both short and long term training of Karate-Do and in turn enhance the quality of your life.